When Time released its list of 2014's 100 Most Influential People, Laverne Cox was no where to be found. Oddly, however, she received the fifth highest number of public votes — even beating out the issue's cover star Beyoncé. Time issued no comment, and perhaps its newest issue was the reason. 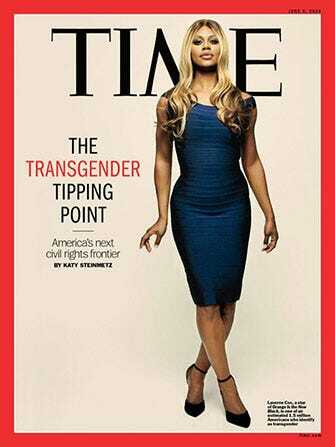 Time believes we have reached what its calling The Transgender Tipping Point, with Cox as its cover star. Statuesque, poised, and authoritative, Cox's highly personal interview presents the LGBTQ activist and actress as a power figure rather than a power figure in submissive mode à la Marissa Mayer in Vogue. "We are in a place now where more and more trans people want to come forward and say, ‘This is who I am,’" Cox explains. "And more trans people are willing to tell their stories." What's more is that this cover and its subsequent interview shows Cox as not just an activist for a niche group, but an activist with a voice that's relevant to all.